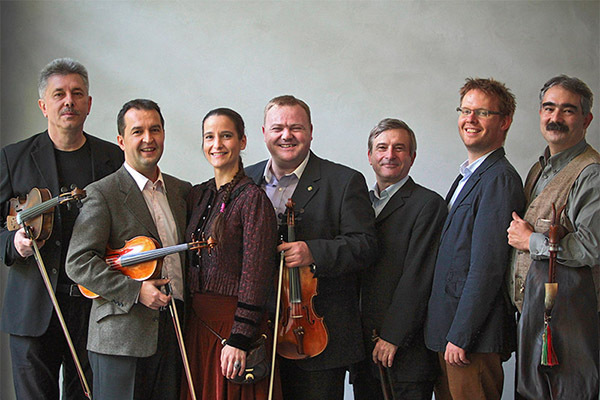 The members of the Fonó Folk Band have been working together since 1997 in Budapest . Band members are devoted to the performance, teaching and researching of authentic folk music at a professional level. Their musical repertoire consists primarily of instrumental and vocal folk music and true- to-tradition arrangements of the instrumental and vocal folk music of the peoples of the Carpathian Basin . Fonó musicians also deal with research and fieldwork in ethnomusicology and apply the experience and information gained in the field in the shaping of their musical image. Experiencing and collecting the music of authentic village musicians (drawing from the ancient source) has enabled them to transform this energy into high quality performance perceivable on their recordings and concert tours. The Fonó Folk Band stands apart from other folk bands in Hungary with the rich sound achieved by the variety of instruments and masterful method of playing. In addition audiences can enjoy not only Hungarian folk music at their concerts but exceptional interpretations of the authentic folk music of other ethnic groups in the region (Slovakian, Rumanian, Jewish, Gypsy, Ruthenian and Croatian). Members of the Band individually and as a whole also venture into other musical genre and can be heard on numerous recordings in cooperation with artists of classical, modern jazz, pop, world music and authentic klezmer music. On occasion the Band will also invite guest performers (i.e. dulcimer player) to enhance the sound for concerts or special recordings. Upon request concert performances can be complemented by short dance performances (i.e. one or two professional dance couples) or “táncház”- style dance party with the involvement of the audience. Sok szép napot éjszakával [All the good days and nights] – Honvéd Ensemble production, Bp.) 1998. Árgyélus kismadár [The Little Bird Árgyélus] - Hungarian folk music from Southern Slovakia (with Gyöngyi Écsi) (Fonó Records, Bp), 2000.